The DT members have done a fabulous job on showing you a large variety of samples, so hop on over and have a peek! I have used a home grown boy for this challenge, they are just perfect for this kind of cards! I've colored with distress ink and the papers are from WeR Memory Keepers. I hope you will join in this challenge! Make a card for the most difficult of the species! Please make a card, or other craft project, using a Sugar Nellie stamp for a male. So is the prize for this challenge. One lucky winner, chosen at random, will win a fabulous mystery prize from Sugar Nellie! This will be the last Sugar Bowl Challenge as you currently know it...changes are afoot, and will be in place for our next challenge! Fabulous en leuk Tiets, pracht kleurtjes.. te gek! Such a cute card Tiets!! 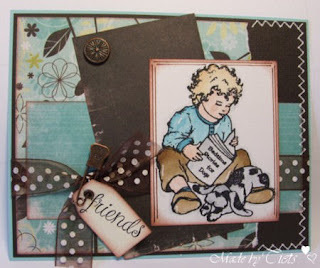 I love the colors and papers that you have mixed with this adorable image!! Your card is very handsome...great job!!!! mooi kaartje geworden jongenskaarten zijn altijd wat moeilijker vind ik. A beautiful card Tiets and a lovely image! Great card Tiets...love the image and the gorgeous ribbon and tag sentiment. Just lovely! love the colours you have chose and the image is adorable, fab card. Yummy card tiets, it is just so gorgeous. I love it! Het is altijd maar moeilijk voor die mannen (en jongens!). Maar dit is echt een superleuk kaartje Tiets! Fabulous card Tiets love the image and how you have put the card together. Have a super weekend. Ohhh Tiets . Die Karte ist wiedr super süß. Thanks for all the geat inspiration again.....super card for a boy.....fab colours. Joy is where you find it! Some more new gorjuss girls!! Let's Party with Gorjuss girls 2!